Born and raised in Southeast Missouri, Jackie is proud of her blue collar, working class upbringing. 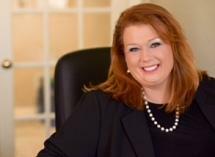 After graduating from the University of Tulsa in December of 1991 and passing the Missouri Bar in April of 1992, Jackie began her law practice in the 24th Federal Circuit; having been an associate with two separate law firms before venturing out as a solo practitioner in 1995. Jackie’s practice is primarily in civil litigation handling family law issues ranging from divorce to paternity and civil litigation involving personal injuries from auto collisions, work related injuries and injuries caused by another person’s negligence. She handles cases in the following counties: Jefferson, Ste. Genevieve, St. Francois, Madison, Washington, Perry and Cape Girardeau. Jackie believes that the greatest honor she has is representing people in a time of crisis. She offers people hope. Along with the practice of law, Jackie is a very involved member of the community. She has four children ranging in age from 20 to 8 and participates in their activities of band, choir, cheerleading, basketball, football, wrestling, track, girl scouts and boy scouts. Jackie believes in telling people the truth and not simply telling people what they want to hear for a retainer.